This is a perfect example of how we are working to find innovative partnering opportunities that expand the utilization of NASA technologies. "The Innovative Partnerships Program Office at Goddard is charged with helping identify novel arrangements, like this one with Ocean Tomo, to bring technologies to the marketplace quickly," said Nona Cheeks, chief of NASA Goddard's IPP Office. "This is a perfect example of how we are working to find innovative partnering opportunities that expand the utilization of NASA technologies." NASA's participation is a result of a new ground-breaking partnership between NASA and Ocean Tomo Federal Services, LLC, a wholly-owned subsidiary of Ocean Tomo. This new partnership focuses on maximizing the value of NASA Goddard's inventions by transferring technologies to commercialization partners, ultimately benefiting U.S. taxpayers and the domestic economy. Cheeks said the arrangement offers several benefits to NASA including the ability to leverage Ocean Tomo's capabilities and expertise in monetizing IP assets through the firm's successful live auction and other transaction platforms. "We are truly honored to partner with NASA – a wellspring of technological ingenuity and creativity," said Dean Becker, Ocean Tomo's Vice Chairman. "Given the agency's world-class reputation and historic technological achievements, it is not surprising that we have already received a significant number of inquiries and considerable interest in the lots." Descriptions for NASA's Lots 56, 57, and 58 are below, and a list of specific patent assets can be viewed online at http://www.oceantomo.com/catalogue. Included in Lot 56 are 11 patent assets that relate to a new signal processing technology called the Hilbert-Huang Transform (HHT). The HHT technology is a highly efficient, adaptive and user-friendly set of algorithms capable of analyzing time-varying processes. Designed specifically for nonlinear and nonstationary signals, HHT can be used to analyze data in a wide variety of applications. The algorithms also provide increased accuracy when used to analyze linear and stationary signals. Winner of the Federal Laboratory Consortium for Technology Transfer (FLC) award for excellence in technology transfer in 2006, the HHT technology offers improved accuracy and yields results with more physical meaning than existing analysis tools. The proprietary rights bundled in this lot would be valuable to companies interested in controls and automation, seismic exploration, reservoir imaging, geographical development and industrial manufacturing. Until now, Global Positioning System (GPS) receivers, while providing an accurate and inexpensive means of navigation, have been limited to low Earth orbit (LEO) missions. The technologies disclosed in the 6 patents offered as Lot 57 are a leap forward for GPS technology. These technologies provide autonomous, real-time, fully spaceflight-qualified GPS receivers with exceptional capabilities for fast signal acquisition and weak signal tracking. These features enable the use of GPS navigation in high and geostationary orbits. In addition, this technology increases the accuracy of independent attitude estimation for use in aerial vehicles as well as ground-based aiming and pointing applications Given the broad scope of this patent portfolio, this Lot offers an opportunity to obtain the exclusive license of next-generation GPS technology and would be of interest to companies within the fields of surveying, navigation, machine guidance, wireless platforms, telecommunication infrastructure and homeland security. The Sensing Technology offered in Lot 58 includes 8 patent assets for capacity sensing elements that can be used as a single unit or as a closely packed array. This new technology eliminates sensor-mounting standoff, exhibits no thermal drift problems and provides crosstalk-free performance. This technology can be used to detect mass thereby enabling use for industrial process controls such as counting and capacity monitoring. Since this technology can also be used for detecting motion, it enables use for safety, security and process monitoring such as object and human detection. To inquire about specific Lots or to register to attend or bid at the Ocean Tomo Fall 2008 Live IP Auction, please contact us directly at 312.377.4851 or auctions@oceantomo.com or visit http://www.OceanTomoAuctions.com. For more information on Ocean Tomo services for Federally-funded inventions, please contact Connie Chang at 240.482.8204 or cchang@oceantomo.com. Established in 2003, Ocean Tomo, LLC (http://www.OceanTomo.com) is the leading Intellectual Capital Merchant Banc® firm. The company provides financial products and services related to Intellectual Property financial & survey expert testimony, valuations, investments, risk management and transactions. Headquartered in Chicago, Ocean Tomo has offices in San Francisco, Palm Beach, Orange County and Washington, DC. 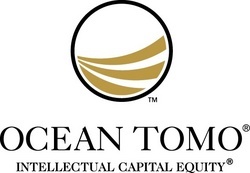 Subsidiaries of Ocean Tomo include: Ocean Tomo Auctions, LLC; Ocean Tomo Federal Services, LLC; Ocean Tomo Asset Management, LLC; and Ocean Tomo Capital, LLC -- publisher of the Ocean Tomo 300® Patent Index (Amex: OTPAT), the Ocean Tomo 300® Patent Growth Index (Amex: OTPATG) and the Ocean Tomo 300® Patent Value Index (Amex: OTPATV).